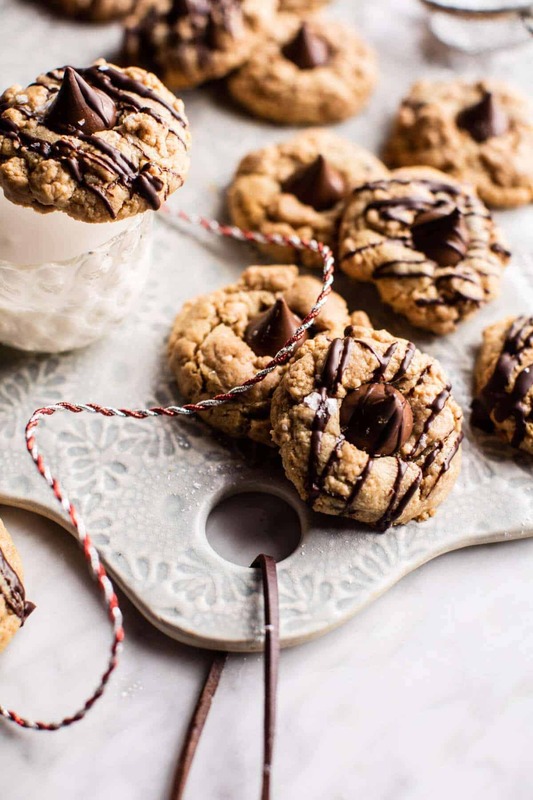 Chocolate Peanut Butter Crinkle Cookies. I wish all Fridays could include cookies like these. 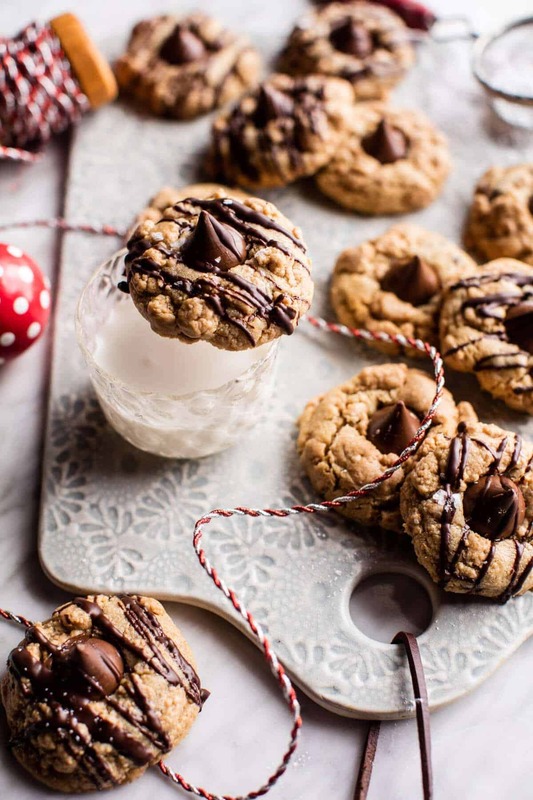 Lucky for us, it’s December and we have an excuse to eat a least a cookie or two a day. I made these chocolate peanut butter crinkle cookies earlier this week and they’re already long gone. Although, cookies never last more than a day or two around here, so I guess that was to be expected. Cookies are everyone’s favorite. As a lot of you probably assumed, chocolate and peanut butter is probably one of my favorite combos. It’s also a big time favorite of my older brother Brendan’s, who arrived with his girlfriend Lyndsie a week ago. Whenever I know people will be coming into town, I always try to make foods that I know they’ll love. Anyway, I guess my point is that I love making foods for the people around me. Sometimes it’s not even a matter of whether I like something, but more a matter of who I am feeding…cough, cough, chicken noodle casserole…Malachi and Creighton. Thankfully, I am a fan of this combo of peanut butter and chocolate. These cookies are the bomb. And by that I just mean SO FREAKING DELICIOUS. Covered in chocolate, rolled in peanut butter, and doughy in the center, yum and YUM. Oh, and a sprinkle of flaky sea salt, you know for good measure. 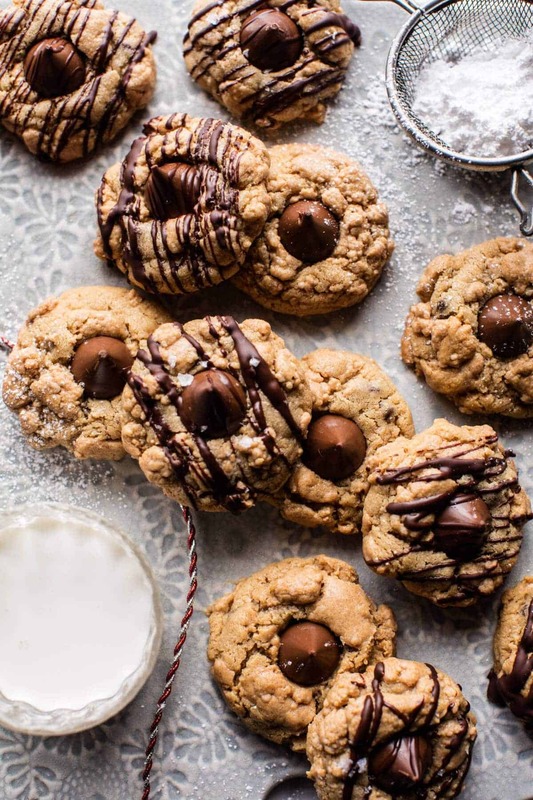 That extra chocolate drizzle you see on a few of those cookies is totally optional, well, it’s not optional in my mind, but you know, if you prefer just a little chocolate…I guess I get that. But the milk chocolate kiss in the center…a MUST. 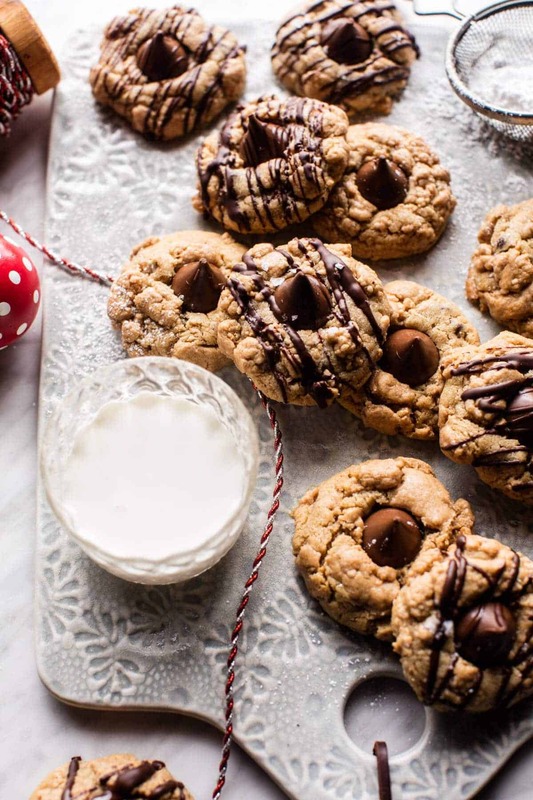 It kind of makes these cookies a cross between peanut butter blossoms and crinkle cookies. 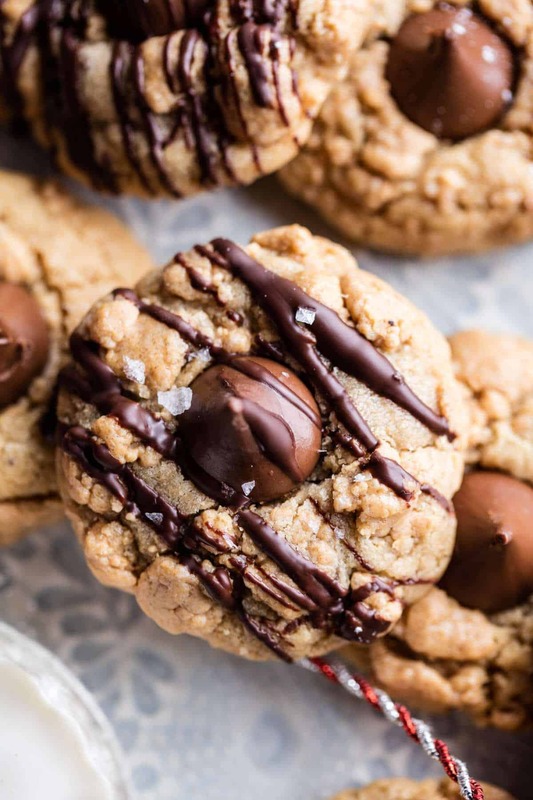 Unlike peanut butter blossoms, these cookies are soft and chewy and not the least bit dense, and the Hershey’s kiss, well that’s obviously perfection. Rolling the dough in the peanut butter and powdered sugar allows for ample peanut butter flavor with a touch of sweetness. It’s honestly just so delicious, like biting into a Reese’s, but in soft cookie form. In fact these might be better than Reese’s. <– bold but possibly true. These cookies would be great for a cookie gift exchange, as easy holiday gifts, or simply to bake up on Christmas Eve and EAT! My whole family is arriving tomorrow and will be here through New Years, so it’s going to be rather crazy around here! I’ll be back tomorrow for the second to last Christmas Drink Saturday and I am pretty excited about it! Also, I’m wondering if I should post the last Christmas Drink on Friday the 23rd, so you guys can have some time to buy ingredients and things, or should I post it on Christmas Eve? Thoughts? Let me know! In preparation for a busy weekend, I think we should all probably be making these cookies tonight while sipping on this. Sound good? COOL. These cookies are the bomb. And by that I just mean SO FREAKING DELICIOUS. Covered in chocolate, rolled in peanut butter, and doughy in the center, yum and YUM. 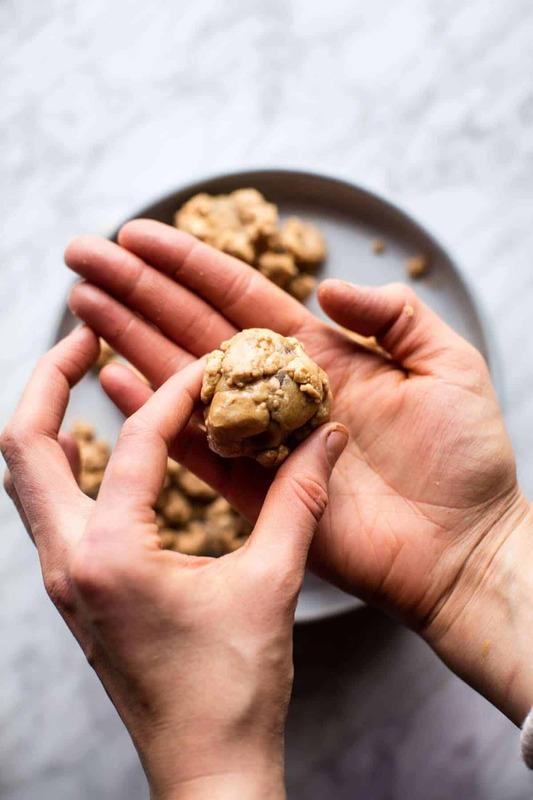 In a mixing bowl, beat together the butter, 1/2 cup peanut butter, brown sugar, and granulated sugar using an electric mixer until smooth and creamy. Add the egg and vanilla and beat until combined. Add the flour, baking soda, baking powder, and salt and mix until just combined. Fold in the mini chocolate chips. In a medium bowl, combine the remaining 1/2 cup peanut butter and the powdered sugar. The mix will be clumpy and moist. Cover and refrigerate 30 minutes or up to 3 days. 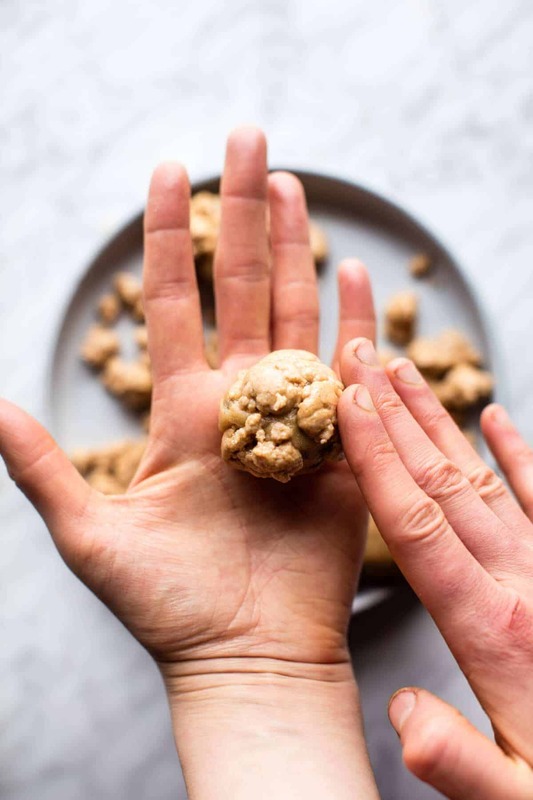 Roll the cookie dough into 2 teaspoon size balls and then roll each ball through the peanut butter powdered sugar mix, pressing gently to adhere. Place 2-inches apart on the prepared baking sheet. Transfer to the oven and bake for 10-12 minutes, until the cookies are just set around the edges but still doughy in the center. It's important not to overbake these as they will be dry and crumbly. 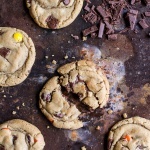 Remove from the oven and insert 1 kiss into the center of each cookie. Let the cookies cool on the baking sheet for 15 minutes and then transfer to a cooling rack to cool completely. If desired, drizzle with melted chocolate and sprinkle with sea salt. Let the chocolate set at room temp. Cookies can be stored in an airtight container for up to 1 week. What are you guys baking up this weekend? Chocolate Dipped Homemade Peanut Butter Samoa Oreo Cookies. Wow these sound delicious! Love the addition of the chocolate kisses in the middle, so cute! Agreed! Definitely making these this weekend! Can never have too much chocolate!! Thanks Rhian!! Thank you for sharing this beauty with us. I also enjoy watching the faces (kids especially) when they bite something that delicious 🙂 I wish you all to have pleasant day! Thanks so much!! Hope you have a great day! Love this recipe! I’ll be baking White Chocolate Gingerbread Blondies. OMG! They looks so tasty and delicious! In the evening I’m going to try to cook’em! Right!? I can’t get enough chocolate haha! Thanks Heather! 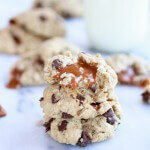 These look so yummy–I hope your family appreciates you! Ah I get so many thanks around this time! haha! So happy you like them Nancy! Oh, yum!! I agree! 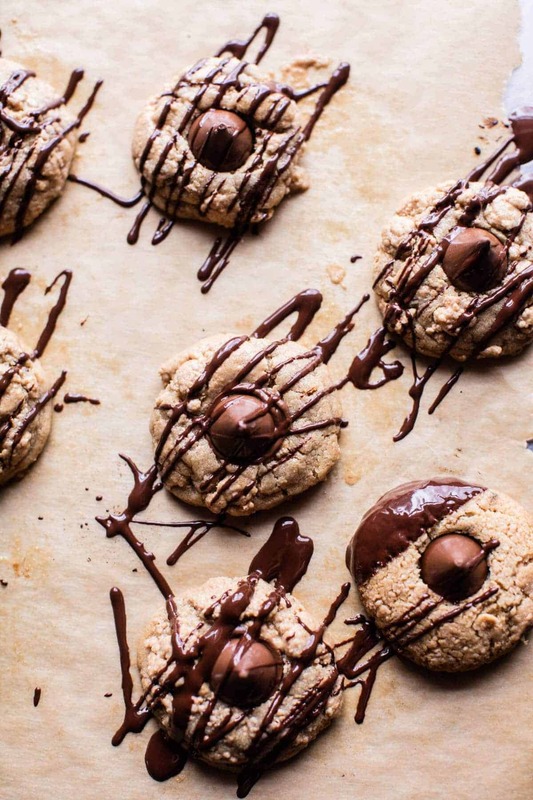 Peanut butter and chocolate belong together. I really love how you arranged the shot! It looks great. All of your recipes are so inspiring, as well as you take your photos. Awh thank you so much Marisa!! I spend a ton of time shooting so it means a lot!! I am so thrilled everyday to visit your webpage and see what gorgeous foody items you have developed and shared with us. I do have a simple request tho. Please allow a photo of the finished dish to be included in the recipe when we print out. I know FOODday, Allrecipes does this.. Your photos are the BEST..and are what MAKE me what to make every single recipe right NOW! I now have to COPY & Paste, shrink the photo I include as it usually fills one whole sheet.. then print to put in my recipe collection…and i want only to have two sheets, front and back to slip in a plastic sheet protector. Thank you for this consideration. Half Baked is my fav recipe place to visit and is always the first ONE everyday. Hey Leslie! THANK YOU so much for you kind words, I am flattered! I am actually working on a new recipe box that will include a photo. Coming soon! Thank you again and Merry Christmas! Yes!! Its so gratifying! Haha agreed!! Thanks Jess! These definitely look much more festive than the ones I have made! Will have to add them in to my holiday baking. Love that cutting board. I’ll be rolling some Russian teacakes and chocolate crinkle cookies over the weekend and they’ll likely be gone by early next week as my son polishes them off pretty quickly. But I’m happy to bake both for and with him, especially at this time of year. As for posting on Christmas Eve…take a breather and spend the time with your family and friends. It sounds like you’ve got a great holiday lined up! I hope you love them! Those sound delicious!! Thanks!! A breather sounds nice!! 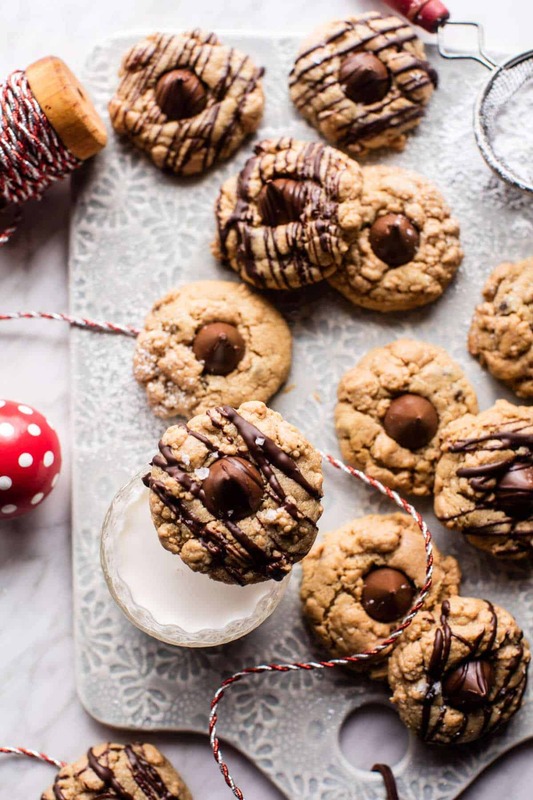 These cookies look so delicious and perfect for gifting. And that drizzle of chocolate? Yes, please! I’ve got to make these and leave a few out for Santa! Another fabulous cookie to add to my holiday baking list! Can’t ever go wrong with the chocolate peanut butter combo! So true!! Thanks Mary Ann hope you enjoy as always!! Who wouldn’t love one of these?! 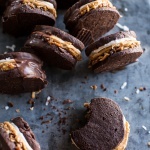 Gorgeous crinkles, love that chocolate PB goodness! Hey Gabrielle! I thin you dough is probably fine, mine is always sticky too, it makes for a soft and moist cookie. Just roll in the peanut crumbles and I think you should be fine. If you can’t roll it, stick it in the fridge for an hour, then roll. That should work too. Let me know if you have other questions. Hope you love these! Hi Stephanie! Try sticking it in the fridge for an hour, then roll. That should help them stay fatter. Let me know if you have other questions. Merry Christmas! 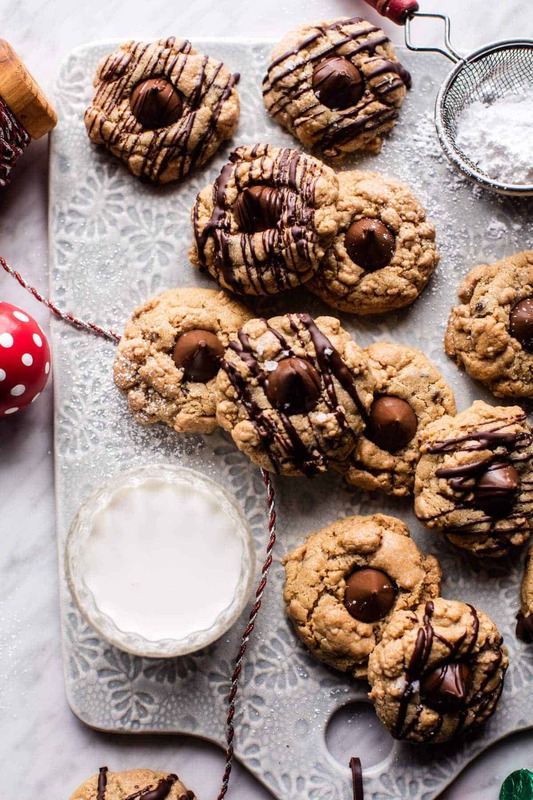 Who says that cookies have to only be reserved for the holidays? I say, a cookie a day keeps a bad mood at bay–at least in moderation! 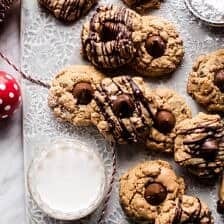 😉 These peanut butter crinkle cookies look fantastic! PB + C are the ultimate power food couple! Made these last night. Did you mean to suggest the crinkle topping should be refridgerated, or the dough? I think it worked better on my second batch when I refridgerated the dough. Otherwise it was too sticky to roll. I also had trouble with the crinkle topping and gave up on that. 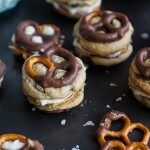 I made these cookies and they are amazing! How should I store them without them sticking together or the chocolate being smashed? What consistency is the peanut butter/powdered sugar crinkle topping supposed to come out like? My cookies came out perfect, and taste amazing, but the crinkle topping remained gooey and got peanut butter all over your fingers even the next day.